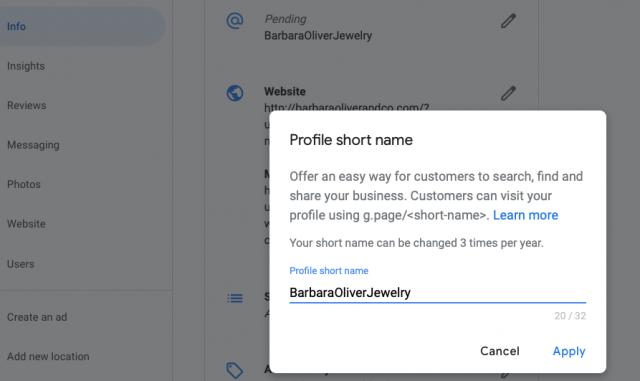 Google My Business is rolling out a new feature to let businesses define their short name and URLs within Google My Business. This way you can when you share your short name, customers can enter the short name URL in the browser’s address bar, like "g.page/[yourcustomname]", to go directly to your Google business profile. Ben Fisher posted about it on Twitter and said "New: Shortnames for GMB Profiles - Think of this as more than vanity URL's, this is an easy way to share your profile and much better than a string of digits. Also, you can solicit reviews with a /review/. A shortname is between 5-32 characters." I personally do not see this feature yet, but I am told it is rolling out. So in Ben's example, you can go to http://g.page/LocalSEO/ and go to his business profile. You can edit your short cut when you login to Google My Business and click on the info tab and then select "Add profile short name." You can also do this via the mobile app under the profile tab. Note: This is not fully rolled out yet.